For Wynn Evans, her first marriage proposal was little more than a childhood crush. Twenty-five years later, Adam Carlyle has grown up into a gorgeous package of handsome, smart, and successful. But the single mom in Wynn is still reeling from her painful divorce and isn’t looking for love–especially not with a younger man. But as she’s about to discover, Adam is a man who doesn’t take no for an answer. . .
Real estate attorney Adam has never forgotten Wynn Evans, who’s even more beautiful than he remembered. Convinced he’s found his match, he knows he can satisfy Wynn’s deepest desires–if only she’ll let herself trust again. But when someone else’s desire for vengeance puts Wynn’s family in danger, the power of Adam and Wynn’s new love will be put to the ultimate test. . . –This text refers to the Kindle Edition edition. Karen White Owens is a lifelong resident of Detroit Michigan. She holds a bachelor’s degree in sociology from Wayne State University and is working toward a masters in library and information science. In addition to writing, she manages an after-school program for a charter school in the Detroit area. She devotes her free time to editing manuscripts for aspiring authors. During the 1999-2000 and 2000-2001 school years she taught the fundamentals of creative writing to the students of the Detroit Writers Guild Young Authors Program (YAP). 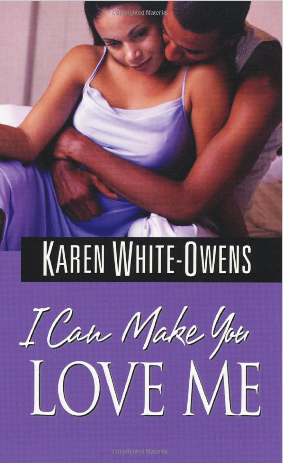 Ms. Owens is the author of six romance novels and one novella. In addition to writing, Karen works as a Library Director at the Lenox Township Librry and teaching freshman essay writing at Wayne State University. Her 2004 novel, Circles of Love received a 4-1/2 Gold review from Romantic Times Book Club, the highest honor an author can receive and was nominated Best Multicultural Novel for 2004. She also received a nomination for Best Hero from the Romantic Slam Jam Emma Awards. Love Changes Everything received 4-1/2 stars Romantic Times Book Club and top pick for November 2005. Her most recent novel Someone to Love is part of a five books series about the Daniels family. Karen’s first Dafina Romance was made available in December 2006. Currently she works as a part time instructor at Wayne State University’s Interdisciplinary Studies Program, teaching writing communications skills to undergraduate students. As a devotes supporter of the Detroit Writers Guild Annual Conferences, she has conducts workshops on characterization and rejection letters and has provides manuscripts critiquing. Gary her husband of twenty-two years is her biggest fan. UPCOMING BOOK SIGNING AND READING: SUNDAY OCT. 9th from 11:00-3:00 for an Author Showcase at Carter G. Woodson Library in Chicago.